There are some things in life that are just plain good. 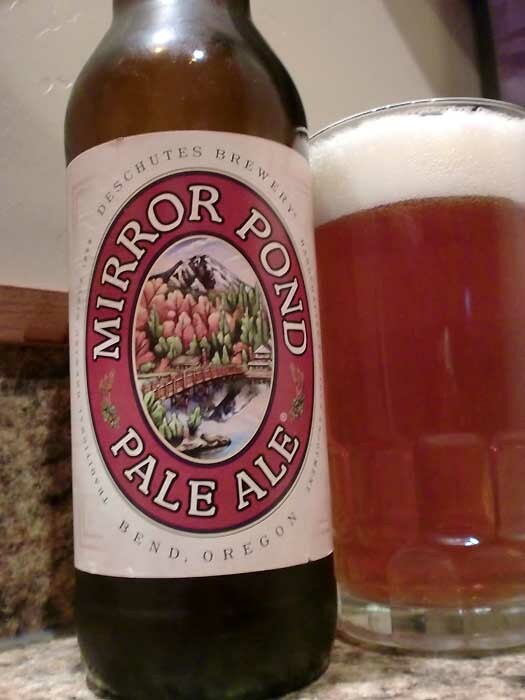 Deschutes Brewery's Mirror Pond Pale Ale is exactly that, just plain good. It doesn't try to be anything it's not. It's not over-the-top or genre-bending, it's just what it intends to be: a very good example of the American Pale Ale style. Like I've said before when I reviewed Deschutes' Black Butte Porter and their 2011 Release of Jubelale, they make some mighty tasty beers. Somebody in their brewery knows what they're doing and they do it well. Mirror Pond pours a dark gold, bordering on amber and smells of mild citrusy hops and some semi-sweet caramely malts. You sip it and get some doughy yet sweet malts and a moderate amount of mild, almost apple-like Cascade hops. It really is well-balanced and quite tasty. There are some Pale Ales that you have to sip slowly because they are so downright explosively bitter and others that you wish had more hops to round out the flavors. Neither is true with this brew... this is well-balanced, hoppy, yet mild enough that you can take big swigs to quench your thirst. Very good stuff which I could drink quite a bit of in one sitting. Drink This: if you want a classic, American-style Pale Ale. Their Black Butte Porter is a great example of an American Porter, whereas this is a great example of the American Pale Ale.